There are times when only a one-pan wonder recipe will do. 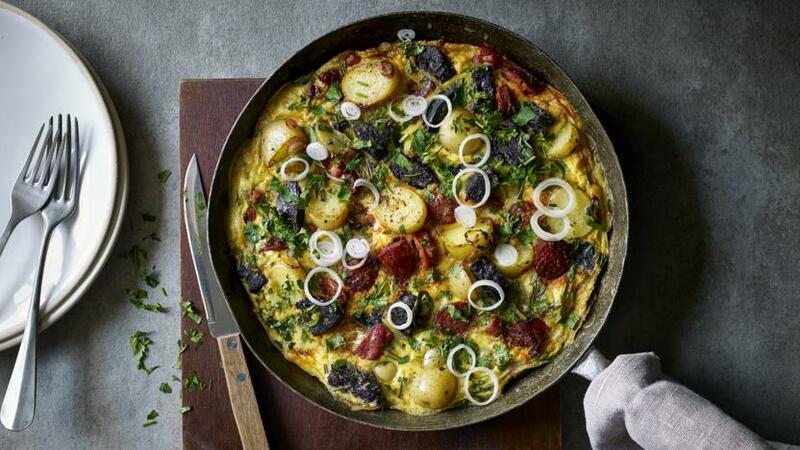 Whether for breakfast or a quick supper, this full English omelette is a good one to add to your repertoire. Cook the new potatoes in salted boiling water for 12–15 until just soft. Drain in a colander then leave to steam dry and cool. When cool, cut them in half and set aside. Heat a 25cm/10in ovenproof frying pan on a medium heat and add a little oil. Fry the black pudding until crisp, remove from the pan and drain on kitchen roll. Add the bacon to the pan and fry until it starts to brown and the fat renders out. Add the whole chorizo to the pan and fry with the bacon. The smoky red paprika oil will start to come out of the chorizo. Remove the bacon and chorizo from the pan and drain on some kitchen roll. When the chorizo is cool enough to handle, slice it thinly.